This is from the halls of Are You Kidding Me? It would seem that Bill and Hillary Clinton want people to view them as being just like the rest of us. Ordinary Americans that need to get from point A to point B. Of course they are in what looks to be First Class but you have to wonder if the Clinton’s believe we the people really are stupid. Or could it be that the Clinton’s have lost all of their clout and can’t hitch a ride on some rich donors private jet? 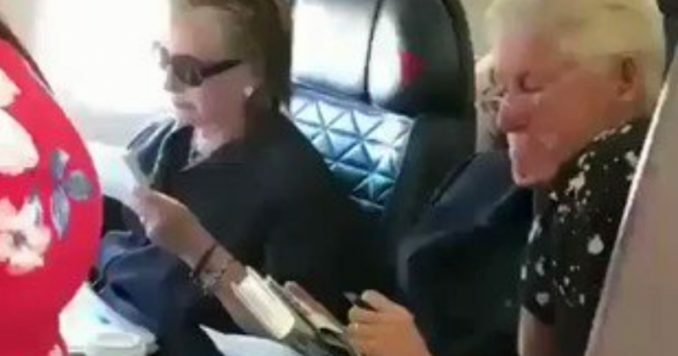 The very interesting thing about this is that since the Clinton’s are doing the ‘nasty thang’ by flying typical commercial like the rest of us little people, its fair to note, they are doing so without the fear of being harangued, harassed or heckled. Unlike folks in the Trump camp who must face daily threats even when getting gas at a gas station. But then, Republican political leaders are not calling for Democrats to be so distressed in public and private. This is just a Democrat tactic. I guess this is also the way Hillary prepares to enter the 2020 presidential race as so many rumors are now predicating. By the way, Bill looks to be doing better health wise, while wifey Hillary seems to be looking a tad bit old. Will this cause you to think of the Clinton’s as being more down to earth? I don’t think Delta Airlines has the power to do that for them.